Justice John McMahon, top left to right, defence lawyer James Miglin, Bruce McArthur and lead investigator, Inspector Hank Idsinga, are shown during a sentencing hearing in Toronto on Friday, Feb. 8, 2019. 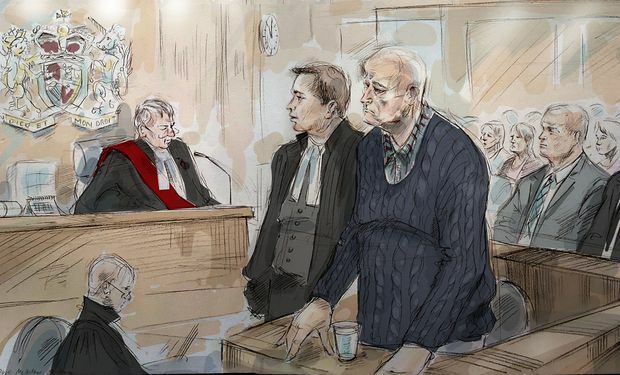 Mr. McArthur, 67, who murdered eight men from Toronto's gay village, won't be able to apply for parole for 25 years. While one can’t feel sorry for those multiple murderers serving a life sentence with consecutive periods of parole ineligibility, there is merit to considering the preservation of hope and potential for rehabilitation. As a retired Correctional Services case manager (parole officer), I can speak to the task of trying to manage offenders without hope of release. With nothing to lose, they have no incentive to co-operate, enhancing the danger they can present. Why take rehab programs when there is no apparent benefit? Why not murder that unpopular inmate or staff member when there is nothing left to take away? While I can see the case for consecutive sentencing as laid out by the Harper government, the safety of staff wasn’t considered. The danger increases as the number of inmates with such sentences increases. If one first-degree murder is punished with 25 years without parole, and there is no added parole penalty for any greater number of first-degree murder convictions, then there is no deterrent to continued killing once the first murder has been committed. Re Trudeau Says He Didn’t Direct Justice Minister On SNC Case (Feb. 8): If the Prime Minister did not discuss the SNC-Lavalin case with the justice minister, he would not be doing his job appropriately since a significant Canadian multinational firm’s future and the jobs of thousands of Canadian employees were at stake. If then, as a result of the discussion (pressure? ), he chose not to “direct” the justice minister to negotiate a settlement with SNC, he was again doing his job appropriately. If then-justice minister Jody Wilson-Raybould decided that the allegations against SNC-Lavalin were too egregious, despite their implications for Canadian jobs and the Canadian economy, to negotiate a settlement without a criminal trial, she, too, was making a decision that she considered appropriate. After all, we learned from the 2008-2009 financial debacle that it is a mistake to believe that there are companies that are too big to fail. However, if Ms. Wilson-Raybould’s cabinet demotion was directly attributable to her decision in the SNC case, that would be more than disconcerting. That decision would reflect poorly on the Prime Minister’s judgment. Harvey Kolodny, Hockley Valley, Ont. When former justice minister Jody Wilson-Raybould was shuffled sideways, my first thought was: What will history ultimately tell us about what really lay behind this decision? It now appears to have been a combination of the tawdry link between corporate needs and politics, plus the cardinal sin of upsetting the PMO. We just returned from Colombia; our trip followed the main highway from Bogota to the border town of Cucuta. For the first time in my 12 years of travelling and working in Colombia, we witnessed columns of refugees heading away from Venezuela. I would ask the professors and union leaders commenting on the situation in Venezuela to see the situation from the ground, not from an ideological point of view. Re CBC’s Problem Is Complacency, Not Netflix ‘Imperialism’ (Feb. 7): John Doyle suggests that the idea of local Canadian productions being erased by Netflix is absurd, then adds that “Nothing is truly absurd if you exist in a state of victimhood.” I’ve never read a better description of the CBC, which rather than up its game with the quality of most of its productions, prefers to raise its begging bowl to taxpayers for more money to produce … what, exactly? More of the mediocrity that Mr. Doyle details? Kudos to CBC president Catherine Tait for finally bringing the weight of Canada’s premier cultural institution to the debate over the cultural threats posed by Netflix and other internet-based media. From radio, to TV, to cable, to satellites, with every new technology that threatened to overwhelm the Canadian media system, the federal government moved to enact regulation to ensure there was space for the representation and exchange of Canadian ideas and perspectives – that Canadians had Canadian media choices. But with the internet, it gave up before the fight began. Yes, there have been issues with ensuring all Canadians are represented in the Canadian media system. But at least there has been a system to struggle within. If history is to be our guide, any regulatory solutions to the current problems will inevitably be fleeting. But as generations of Canadians before us recognized, to surrender to the latest technology would be to give up seeing ourselves in our own media. Canadian stories, Canadian attitudes and values, and Canadian perspectives would quickly be overwhelmed by a calculus that puts profits ahead of the reflection of Canadian ways of life – and that’s no choice at all. Re The Blah Of The Land (Feb. 2): Your headline last Saturday captured the generally disparaging and condescending tone of your article about the temporary House of Commons and Senate chambers: “far more boring,” “a lack of imagination,” “even less drama,” “a missed opportunity,” “dull,” with “no particular personality.” You get the picture. We, on the other hand, consider the new quarters to be bright, cheerful and full of light. They take great advantage of the spaces into which they have been inserted. The House, for instance, uses the vertical lines of the desks and balconies to complement the oval spaces of the chamber and the ceiling. We find the new Senate building to be a fine work of architecture. We were astounded to see how well the structures of the new east side of the old station, after several years of renovation, resonate with its spectacular original columns in the front. Most important, we find the architects have taken to heart their mission to create “temporary chambers.” The budgeting and the harmonious, uncluttered designs fulfill that mandate. Imagine the uproar if they had presented extravagant creations for MPs and senators to meet while the main structures on Parliament Hill are rebuilt. The architects and designers, the public servants and legislators deserve our praise for a job well done.